The overdue OnePlus Two release date is about three to four business days away, according to the budget Android phone maker. "We're always looking for ways to shake up the tech industry," tweeted OnePlus' official Twitter account. "And we think it's time for change. Find out more June 1." It is about time. It's been 13 months since the OnePlus One launched and became an Android sleeper hit on our best phones list. 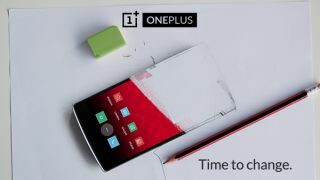 Come Monday, the much-anticipated OnePlus Two is expected to also introduce a sequel to the company's whacky invite scheme. Like the OnePlus One, purchasing the Two means wading through an invite scheme that limits the phone's availability at first. This gives the relatively new Chinese firm the ability to ramp up production and increase anticipation for the smartphone on a budget. Invite seekers go into a frenzy. The trade-off may be worth it. The OnePlus Two specs are supposed to equip the phone with a similar 5.5-inch display, but up the internals to a flagship-worthy Snapdragon 810 processor and 3GB of RAM. OnePlus Two improves to a 16-megapixel main camera and 5-megapixel front-facing snapper, while the battery chugs along with a better 3300 mAh capacity. Whether or not it gets a metal instead of plastic build and dual speakers remains to be seen and heard on the teased June 1 release date.